High precision cross section data are required for the development of the next generation of nuclear reactors, the so-called Generation IV fission reactors. These are fast reactors, more secure than the current available reactors, producing a smaller quantity of radioactive waste and therefore offering a reliable solution to the energetic needs of humanity while minimizing the quantity of CO2 emissions. A significant international effort is therefore made for the measurement of the neutron-induced reactions on isotopes of interest for the development of the Generation IV reactors. We are involved in high-precison neutron inelastic cross section measurements performed at the neutron time-of-flight facility GELINA operated by JRC-Geel in Belgium. The experimental setup consist of an array of 12 HPGe detectors operated together with a 235U fission chamber used to integrate the neutron flux. These are located at a end of a 200-m flight path (recently moved at 100 m), allowing cross section measurements by combining the γ spectroscopy and the time-of-flight techniques. The resulting data are unique in the world for their precision, neutron energy resolution and reliability. The picture below (taken from reference ) displays the production cross section for the first gamma transition in 56Fe compared with other previous measurements emphasizing the quality of our results. A second experimental facility we use to measure neutron-induced reaction cross section is n_TOF, the neutron time-of-flight facility of CERN . The neutron flux and the experimental setups installed there are complementary to the ones available at GELINA. They are particularly fit for neutron capture and neutron-induced fission measurements. Being part of the very broad n_TOF collaboration, we are primary involved in the effort of adapting the HPGe detectors to the particular experimental environment available there while we participated during the years to numerous other experiments. For more details please see the references below or contact one of us. A. Negret, L.C. Mihailescu, C. Borcea, Ph. Dessagne, K.H. Guber, M. Kerveno, A.J. Koning, A. Olacel, A.J.M. Plompen, C. Rouki, and G. Rudolf, Cross section measurements for neutron inelastic scattering and the (n, 2n) reaction on 206Pb, Phys. Rev. C91, 064618 (2015). A. Olacel, C. Borcea, P. Dessagne, M. Kerveno, A. Negret, and A. J. M. Plompen, Neutron inelastic cross-section measurements for 24Mg, Phys. Rev. C 90, 034603 (2014). A. Negret, C. Borcea, Ph. Dessagne, M. Kerveno, A. Olacel, A. J. M. Plompen, and M. Stanoiu, Cross-section measurements for the 56Fe(n,xnγ) reactions, Phys. Rev. C 90, 034602 (2014). 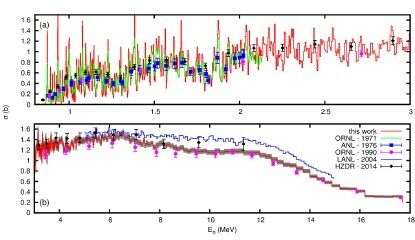 A. Negret, C.Borcea, A.J.M.Plompen, Neutron inelastic scattering measurements for background assessment in neutrinoless double beta decay experiments, Phys. Rev. C88, 027601 (2013). M. Kerveno, J. C. Thiry, A. Bacquias, C. Borcea, P. Dessagne, J. C. Drohe, S. Goriely, S. Hilaire, E. Jericha, H. Karam, A. Negret, A. Pavlik, A.J.M. Plompen, P. Romain, C. Rouki, G. Rudolf, and M. Stanoiu, Measurement of 235U(n, nγ) and 235U(n, 2nγ) reaction cross sections, Phys. Rev. C87, 024609 (2013). D.Deleanu, C.Borcea, Ph.Dessagne, M.Kerveno, A.Negret, A.J.M.Plompen, J.C.Thiry, The gamma efficiency of the GAINS spectrometer, Nucl. Instrum. Meth. Phys. Res. A624, 130 (2010). A comparison of the 25Mg(α, nγ)28Si and 28Si(n, nγ)28Si reactions. The charged particle induced reactions play an important role in many fields: nuclear structure investigations, astrophysics, medicine applications, etc. But our primary interest in investigating charged-particle induced reactions goes towards the understanding of the reaction mechanisms. We attempt to compare neutron and charged-particle induced reactions exploiting various particularities of the nuclei. 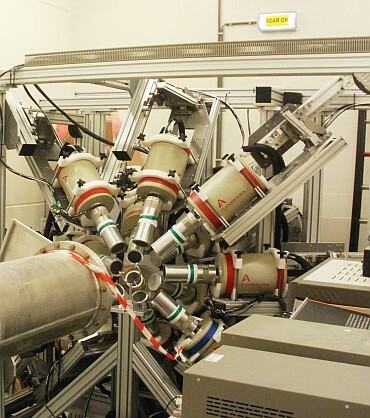 The experiments are carried out at the 9 MV Tandem accelerator of IFIN-HH using γ-spectroscopy techniques to measure the cross sections. Various setups were used, from a simple one using two HPGe detectors to the employment of the entire RoSphere array. In reference  we made a comparison of the γ-production cross sections from the 28Si nucleus excited through two reactions (see the figure below, taken from reference ): 25Mg(α, nγ )28Si and 28Si(n, nγ)28Si. In this case we investigated to which extent one could use the Bohr hypothesis (stating that the compound nucleus "forgets" the input channel) to generate neutron cross sections based on the charged-particle cross sections. If you wish to know more about this topic and about our future investigations please contact one of us. A. Negret, C. Borcea, D. Bucurescu, D. Deleanu, Ph. Dessagne, D. Filipescu, D. Ghita, T. Glodariu, M. Kerveno, N. Marginean, R. Marginean, C. Mihai, S. Pascu, A.J.M. Plompen, T. Sava, and L. Stroe, Cross sections for inelastic scattering of neutrons on 28Si and comparison with the 25Mg(α, n)28Si reaction, Phys. Rev. C88, 034604 (2013).